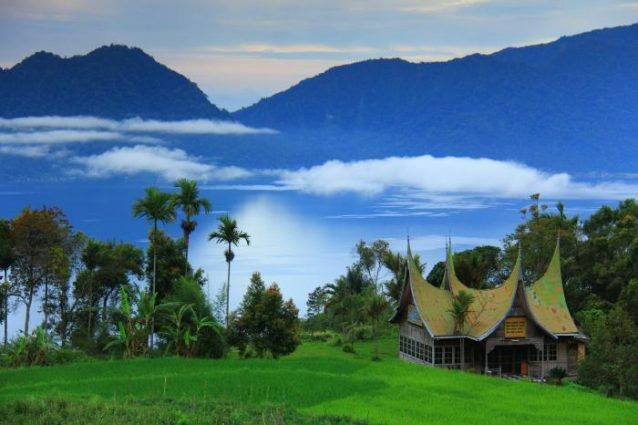 Lake Maninjau, located in Agam District, West Sumatra, is the second popular natural attraction in Sumatra after Lake Toba. The beauty of Lake Maninjau makes people believe that God created Indonesia when He was smiling. Let’s find out the wonderful things to do in Lake Maninjau ..! To get to Lake Maninjau, you will pass the descending and winding road. Local people call it Kelok 44 which means 44 turns. This refers to the number of turns which are 44. Kelok 44 has a length of about eight kilometers. 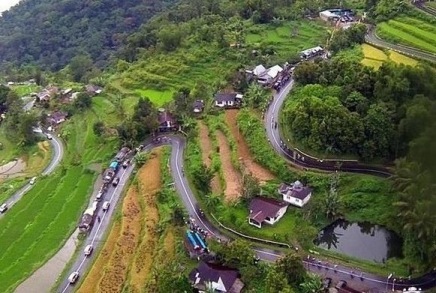 Kelok 44 becomes a popular destination for tourists to enjoy the beauty of Maninjau Lake from the bird’s eye view. There are many resting areas on the roadside for tourists to stop and enjoy the beauty of Maninjau Lake. Muko Muko Park is located on the shores of Lake Maninjau. Here you can relax while enjoying the ripples of Lake Maninjau waves. Around Muko Muko Park there are stalls selling typical food of Maninjau Lake, namely Rinuak. Some might say it is incomplete visiting Maninjau Lake without tasting the delights of Rinuak. Muko-muko Park also serves as a recreational park with various rides for children. In addition at dusk you can see the beauty of the sunset covering Lake Maninjau. 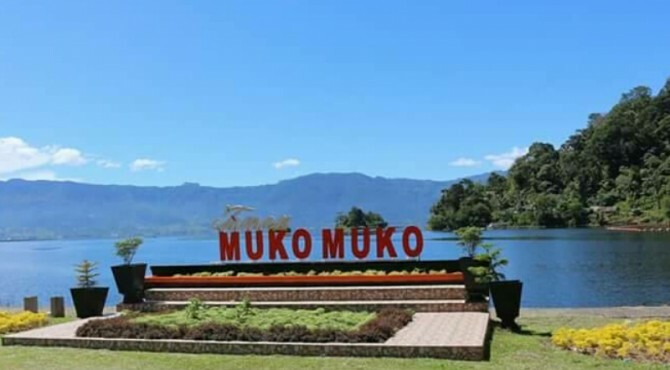 Muko Muko Park is one of the flagship attractions of the government of Agam Regency to drive the tourism industry. Buya Hamka is a great scholar from Minangkabau. 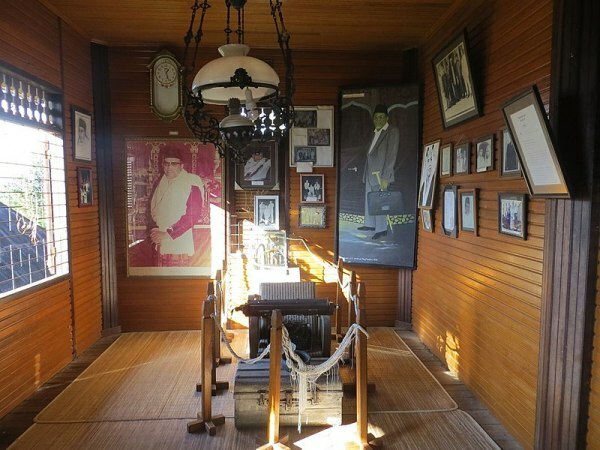 His house near Lake Maninjau has been converted into a museum in honor of him. The museum stores the work of Buya Hamka who is also known as a writer, journalist, interpreter, as well as a politician. In addition to his works, visitors can see a variety of relics and documentation of the life of Buya Hamka. Among the museum’s important collections are the paintings, photos of Buya Hamka from youth to adulthood and the numerous awards he earned during his lifetime. There is also a collection of robe and toga worn by Hamka while receiving a Doctorate Honorius Cauca in Al-Azhar Cairo and the University Kebangsaan Malaysia. Malintang Village, located on the shores of Lake Maninjau, has a unique tradition called Balangge. This tradition was created by the ancestors of Malintang Village. 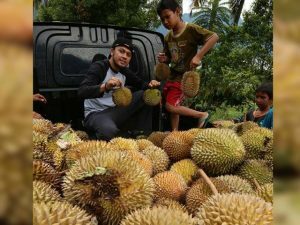 They were aware that durian, which has high economic value, had caused social problems. The social and economic disparities between durian garden owners and residents who do not have durian gardens can cause conflict. The tradition gives an opportunity to people who have no durian gardens to scavenge durian that falls from the tree in the garden of anybody within the stipulated time, i.e. from 4 am to 6 am. This tradition also binds garden owners. They will be subject to sanction if they picking the durian from the tree. The sanction is their durian tree will be skinned to death. Malintang Village’s durian is well known for its delicacy. So if you wonder what to buy in Sumatra, durian can be on your list. Aia Tigo Raso is a unique attraction. It is a spring that has three flavors. Depending on the person who tastes it, the spring may taste salty, sweet and bitter. Locals believe that Aia Tigo Roso has the efficacy to cure diseases. Aia Tigo Raso is located in Jorong Muko-Muko, Nagari Koto Malintang, Tanjung Raya, Regency of Agam. It is also located near Muko-Muko hydropower, only about 1 km. Thus it is easy to find Aia Tigo Raso. You will not miss it because there is a signpost saying “Objek Wisata Aia Tigo Raso”. 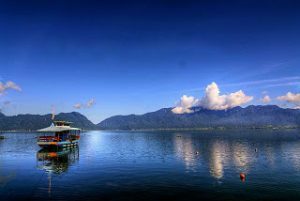 The beauty of Lake Maninjau is certainly interesting to immortalize. You can take the angle by the lake or from high ground. The quiet lake, the settlement scattered around the lake and the green hills no doubt will produce stunning photographs. Every corner of Lake Maninjau offers an irresistible charm. Morning, day or afternoon is the best time for photo hunting. DLSR camera, compact camera or even a smartphone can be your weapon to capture the beauty of Lake Maninjau. You can enjoy the beauty of Lake Maninjau from the boat. At a cost of Rp 6,000 per person, you will be taken around Lake Maninjau. In addition to the boat, you can also enjoy the beauty of Lake Maninjau from the ground. The cost of renting a motorcycle is Rp 80,000 per day while the bike is Rp 25,000 per day. While strolling around, take time to taste “Palai Rinuak”, a local specialty. 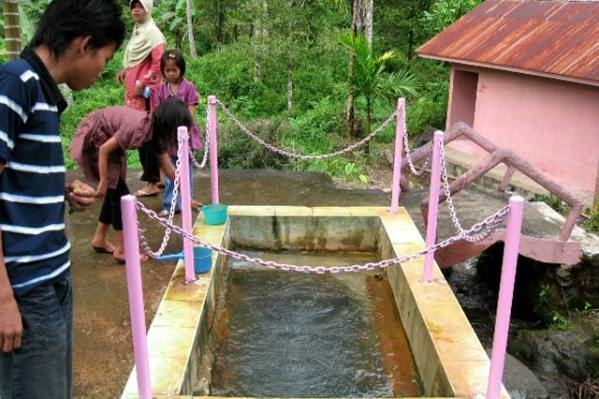 It’s definitely one of things to do in West Sumatra. The food is made from certain fish that only live in Lake Maninjau. The fish is very small, probably only about the size of a broom stick. In addition to Kelok 44, other popular attraction around Lake Maninjau is Puncak Lawang. 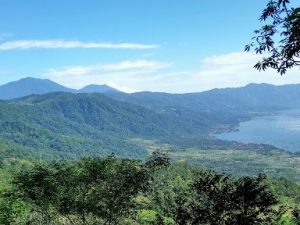 It is the highest hill of the hills around Lake Maninjau. Puncak Lawang is located right before you go down the first turn of Kelok 44. There’s a signpost, so you definitely will not miss it. 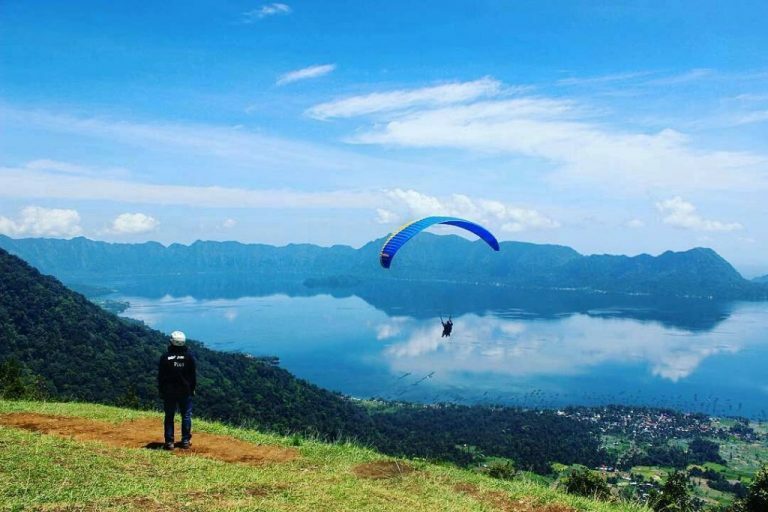 From Puncak Lawang you can enjoy the breathtaking view of Lake Maninjau. 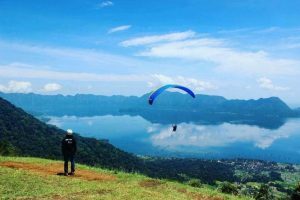 Puncak Lawang is also famous as a place of paragliding sport. Sakura Hill is the alternative of Puncak Lawang to witness the view of Lake Maninjau from high ground. The best time to visit Sakura Hill is at dusk. The beautiful sunset at Lake Maninjau can be seen clearly from Sakura Hill. To get to Sakura Hill visitors can rent a motorcycle at a cost of Rp 60,000 per twelve hours. But it takes a savvy skill in riding a motorcycle because the road is narrow and winding. The best option is to ride motorcycle taxi at a cost of Rp 5,000 for locals and Rp 10,000 for foreigners. 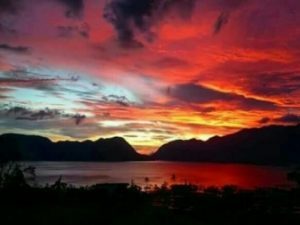 Do not miss the sunset at Lake Maninjau. Sunset on Lake Maninjau is not less beautiful than sunset on the island of Bali. The reflection of sunlight on the surface of the lake creates a breathtaking scenery. The expanse of green hills and the afternoon breeze offer tranquility for the mind. Thus sitting by the lake while enjoying a cup of tea will be a fun experience. In addition, the flickering lights of the houses on the edge of the lake add to the beauty of the dusk. Btw, besides Lake Maninjau, Lake Ranau is also a great spot for sunset viewing. 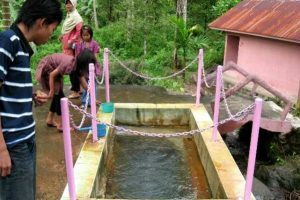 It’s one of things to do in South Sumatra. As you can see, there are various wonderful things to do in Lake Maninjau. It’s the perfect place for vacation with family or friends. So give yourself a break and come to Lake Maninjau.